Will my dog like the doghouse? What size dog house to get? What is the best outdoor dog house? What is the best indoor dog house? Best dog house for large dogs? Some dogs can’t get enough of the outdoors, and they might even prefer to sleep in the yard rather than inside the house in a dog crate. Other dogs are kept outside while their family members are at work and at school, and some will just spend the occasional half-hour out in the garden. No matter how much time your dog spends outdoors, it is probably a good idea to provide them with a comfortable dog house to curl up in; so that they have somewhere to go if they would get cold, tired or if it would start to rain. Finding the right dog house is not hard if you know what you are looking for, and what the options are. There are plenty of different models, materials, and sizes to choose from, and there is something for everyone. One thing is for sure; your pup will thank you once he or she has a dry and safe space to crawl into. Getting the best dog house ever is something we all wish we could do for our dogs, especially if having a dog that simply prefers the outdoors. This sturdy dog house is made from dried cedar, which is a material that is durable and long-lasting, it has a slanted roof to help drain water when it rains, pre-drilled holes for quick assembly and a removable floor for easy cleaning. It is one of the best outdoor dog house options on the market, due to being elevated from the ground to keep moist and water from entering the wood. The roof can also be opened, something that makes these among the best dog houses in the world for a dog owner who understands the importance of keeping a dog’s living quarters clean. Why We Like It – One of the best dog houses for large dogs and small dogs alike since it comes in different sizes for you to choose one that suits your pup and his or her needs. 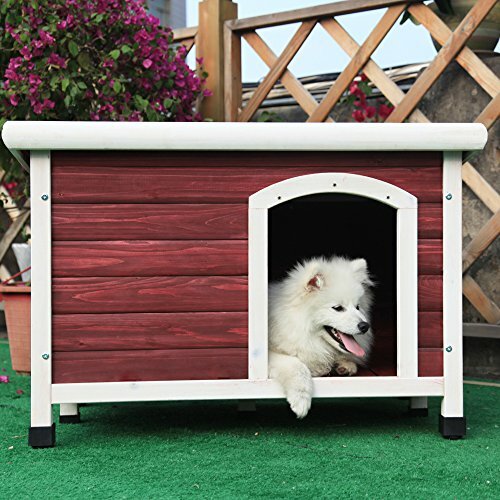 Getting the best outside dog house is important, since your dog deserves a nice, warm and dry place to rest, and this dog house model is one you can’t go wrong with. Make sure they can get to it with a dog flap! Keep your pooch happy, comfortable and dry with the best dog houses made of durable resin. These top dog houses will accommodate a dog weighing up to 100lbs, and the pieces easily snap together so that anyone can assemble it and disassemble it, regardless of skills and experience. There is plenty of ventilation for a good air flow, and the material can be wiped off or hosed down when needed. It keeps the dog safe from rain, snow, and sun, and vinyl door covers are included. 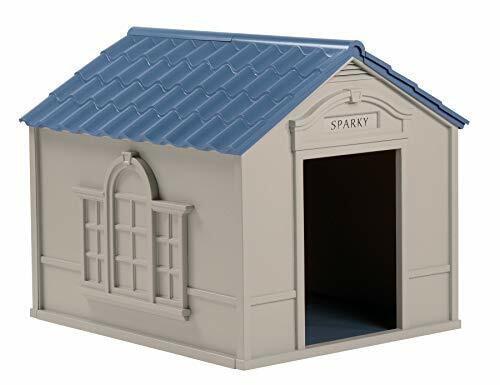 This cute and surprisingly good dog house also comes with small letters that can be used to add the pup’s name above the door; something that makes personalizing it incredibly easy. You can keep it in a fixed spot in the yard, inside the house, or use it to take with you when going away for a trip. Why We Like It – These are among the best-rated dog houses available, thanks to its simple design, easy assembly, and fairly light-weight material. It is easy to transport once disassembled, and it is a recommended option for those looking for the best large dog house. Pssst! Large dogs will love these beds for their new house! The best outdoor dog houses are those that will keep your four-legged friend from getting wet and cold, and these adult and puppy dog houses do just that. 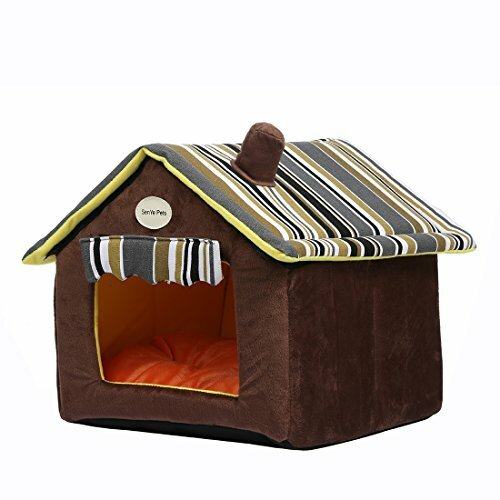 It is built with insulation foam inside all the walls as well as on the raised floor, which guarantees that your fur friend will sleep comfortably regardless of the weather conditions outside. There is a door that opens when pushed and that closes by itself, so that wind and cold air won’t get inside while your pet is taking a nap. The insulation material used is commonly used in construction, and this product has been thoroughly tested to make sure it lives up to what it promises. 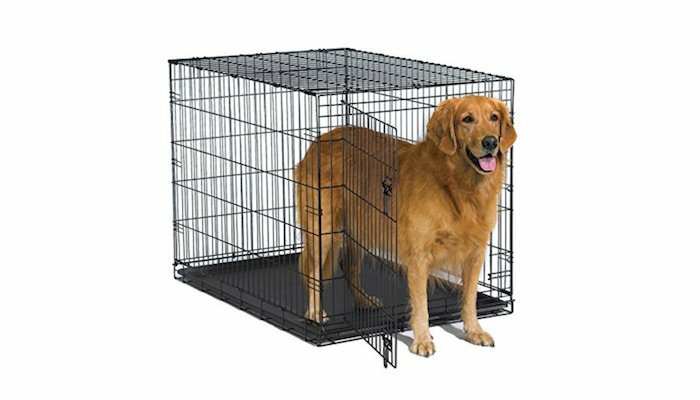 It makes a great medium size dog house for Labs and similar breeds but can fit dogs as large as a small St. Bernard. There is good enough ventilation to provide constant airflow, without the dog house getting drafty on chilly days. Why We Like It – When starting to browse through product options, you obviously want to be getting the best dog house for your furry family member. 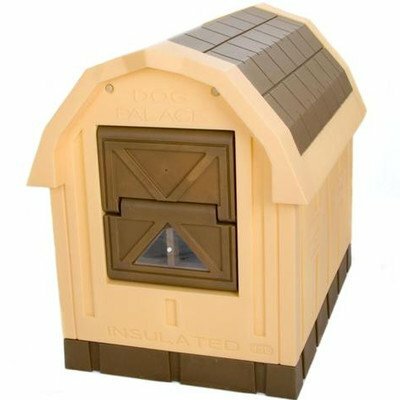 These durable dog houses are big, spacious, properly insulated and – let’s face it – quite adorable, and it will fit in great in the backyard! These top rated dog houses come in sizes to accommodate all types of dogs, and it is made with high-quality materials and built to last. The roof opens up to make keeping it clean easy and quick, and you can even keep the top open on sunny days when your dog might want to lounge in the warming beams for a bit! The construction is waterproof, can be assembled and disassembled quickly for easy transport and it has a discrete and classic design that will fit well into any backyard. 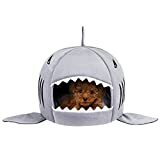 These are good dog houses for pups that like to spend time outside, but that want their own little den to hide away in, where it is always warm and dry. Why We Like It – When you are looking to buy dog house solutions for your outdoorsy pups, these heavy duty dog houses are well worth the investment due to being incredibly sturdy, and for the function that allows you to open up the roof and remove the floor for easy cleaning. A dog house can otherwise be a growing ground for bacteria – a problem you won’t have to deal with if buying one of these. Who wouldn’t want to have a warm and dry igloo to crawl into when it is freezing outside; a private space where you can rest and hang out, without being bothered by anyone? 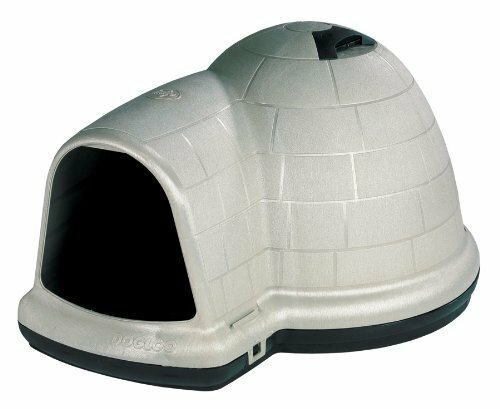 These great dog houses provide protection all year-round, with insulated walls that protect from both heat and cold. It is nice and wide – offering plenty of room – and it comes in different sizes to accommodate small as well as large dogs. The door is cleverly separated from the sleeping area, to eliminate the risk of outside wind and dirt coming into the sleeping den. It is Petmate’s best dog house for outside dog breeds, and dogs often tend to love the coziness of it, as it speaks to their instinct of making a den. The material helps prevent the growth of odor- and stain causing bacteria. 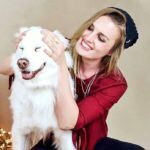 Why We Like It – What you consider to be the best dog house for your pup might not always be their first choice, and many dogs are the happiest with something that resembles a natural den. The design of these products makes them among the best dog houses seen from a dog’s perspective, and they are durable and easy to keep clean. A simple yet popular design used for some of the best dog houses for big dogs! It is a weather-proof and durable construction made to keep your fur buddy dry, warm and out of reach from cold winds as well as hot sunbeams. The rustic barn shape is a fun addition to any backyard, and it comes available in 4 different sizes – made to fit dogs weighing from 15lbs and to 90lbs. 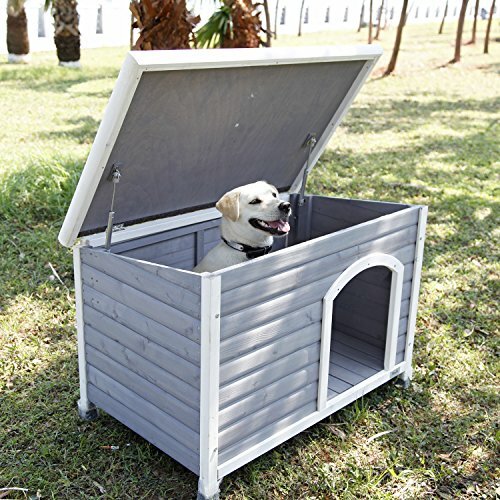 It is the kind of dog house that all outdoor loving dogs will appreciate, and the big door makes it possible for them to lie comfortably; protected from the elements, while also being able to see what goes on outside. The bottom half and the top half are conveniently snapped together when assembling, which does not take more than a couple of seconds. Why We Like It – When you need a simple and quick solution for your dog – this is the way to go. It keeps them dry and safe from the outdoor elements and is very lightweight for easy transport. Not all dog breeds do well when left outside, but indoor dogs might also need a house to curl up in! This product is a soft little hideaway for your pup, where he or she can get some privacy when needed. It is made with quality polyester, it has a removable cushion that can be easily washed and anti-skid material underneath that keeps the dog house in place. It is great for small dogs that like to push their belongings along the floor since this house won’t move even if they try. 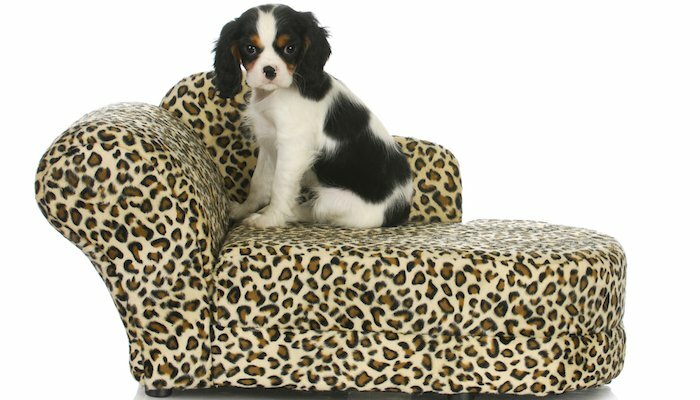 Pick the color and design that will best fit into your home, and let it be part of the house décor, while also serving as your pet’s cozy and cushioned miniature den. Why We Like It – Many dogs love having a small and cozy space where they can hide away from the world, and this is a great option for the smallest pets in the family, and it gives them a sleeping area where they can feel safe and protected. This Boomer and George dog house is for the dog owner who wants to give their pup a luxury home to call their own. 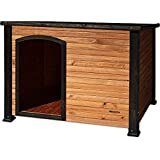 It is more than just your regular dog house, as this one is made out of solid wood, with a roof covering the small porch, and there are two large openings for two dogs to use the house at the same time. It looks almost like a carefully crafted playhouse for children, and it will look incredible in the backyard or anywhere outside the family home. The asphalt roof keeps rain from coming in, and the raised design makes sure the pet house stays warm and dry even when the ground is damp. The center divider wall can be removed if preferred, and the product can be used for one or two dogs. Why We Like It – What is it that they say? Go big or go home? 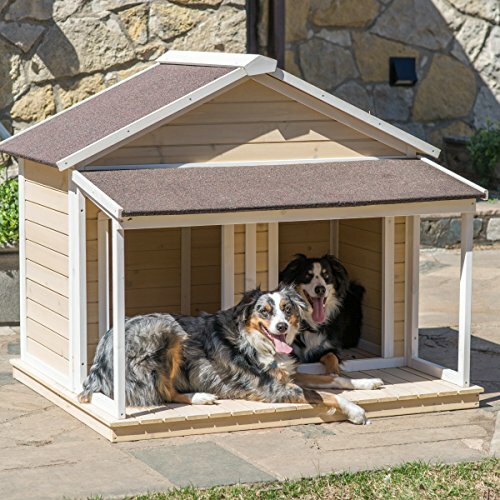 This magnificent dog house is definitely a way of going big when getting a new crib for your pooch, and it can be used for two dogs at once – either with the separator to make it into two houses or by letting the dogs be inside the house together. Are you looking for a hygienic option that will provide your lovely with shelter, comfort and a space to call their own? 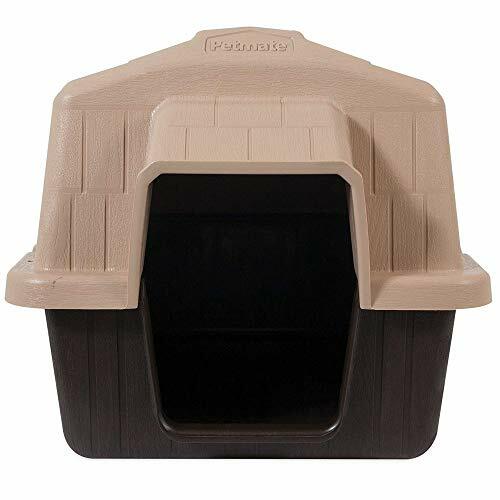 This durable plastic house is easy to keep clean; it can be wiped with a cloth or hosed down and scrubbed, and the material is an unattractive environment for fleas and other creepy crawlers, which is great for a dog house that is kept outside. It is ideal for warmer climates since it does not have insulation and will shield a dog from rain and sunlight. You can always fill it up with pads and blankets for additional comfort, and it is an affordable option that satisfies in both quality and function. Why We Like It – Several dog houses are too insulated to be suitable for warmer areas, but this dog house is perfect for a hot or humid climate. It will keep the dog cool on sunny days – shielded from the sun – and dry when it rains. If your medium sized dog is in the need for a new dog house, then this might very well be a perfect choice. The sturdy plastic material makes cleaning easy, and a clean dog house means fewer bacteria and a healthier and happier pup. There is plenty of ventilation to make sure there is always a fresh air-supply inside the doghouse, and it is completely waterproof. No dog wants to get wet while they rest, and with this neat little plastic house – they won’t be. To assemble it, you only need a screwdriver, and it is so easy that even someone who has never used a screwdriver before can do it. 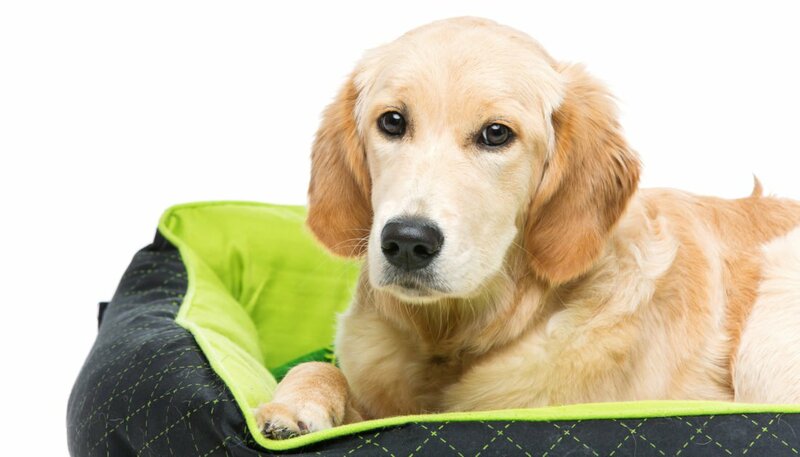 The slight floor elevation keeps it from absorbing cold from the ground, and your dog will rest comfortably both in warm weather and on chilly nights. Why We Like It – While this house is entirely made of plastic – the walls are thick enough to withstand cold, especially if filled with warm blankets. It is cheap and affordable, yet durable and high-quality so that you can give your fur bestie what he or she deserves without spending a fortune. When buying a new dog house for your pup, there are a few things to consider if you want to make a successful purchase. Not all dog houses are apt for all dogs or situations, and it is essential to know your dog and your circumstances well enough to pick a product that will serve the intended purpose. You need to have a look at materials; since one material might be better suited for some living areas, while other materials are better for another. Before potentially choosing one of above top 10 dog houses, you need to take a moment to sit down and figure out what it is that you are looking for, and what would best help keep your dog comfortable. Now, the million-dollar question – “Do I want to get a wooden dog house or one made of plastic?” Quality wooden dog houses are usually just as water resistant as a plastic house since they are treated with water resistant paint and similar. It is important to make sure that the paint used is non-toxic, especially if your dog is a chewer, and the roof should be covered with a water-resistant material (look for asphalt roofs). Wooden houses tend to be better suited for cold climates since they can be insulated to keep inside cozy and warm regardless of weather conditions. Plastic dog houses come with the benefit of being very easy to clean. They can be hosed down or wiped off, and it usually doesn’t take more than a minute or two – which saves both time and effort. It is essential to keep a dog house clean since it can otherwise become a grow-ground for bacteria. Another plus is that plastic keeps fleas away, as well as termites and other small and irritating bugs. 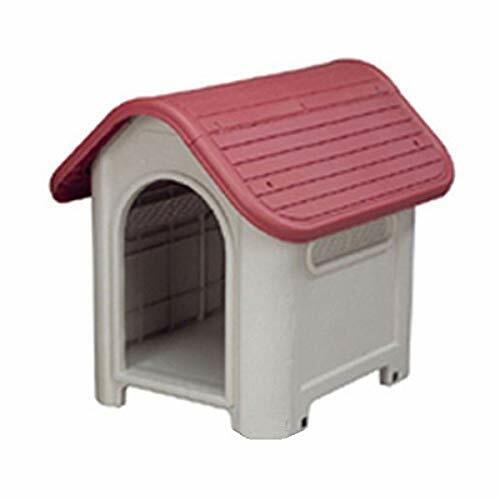 A plastic dog house works best in warmer climates or with moderate temperatures since they do not retain heat as well as an insulated wooden dog house. Insulation is a way to make an outdoor dog house better suited for cold weather and is usually found in quality wooden dog houses. It can either go inside the wall of the house, making it something you can’t see, or cover the inside of the walls – creating a soft and cushioned interior. If you live somewhere where nights get cold or where your dog might be outside during the winter, then you definitely want to make sure that you get a dog house with insulation, so that your pup can rest comfortably without having to struggle to stay warm. Getting your dog a winter jacket to stay warm is also a great idea. For cold weather use, you might also want to aim at getting a dog house with a door flap, to prevent cold air from coming in through the opening. The design of the doghouse probably won’t matter much to your dog, as long as it is comfortable to sleep in and big enough for them to fit. Focus more on the material and the features of a product and choose a design that fits well into your backyard, since you will be seeing it every day. 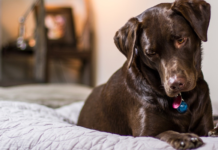 With all the options available on the market today, it is more than possible to find one that your dog will love to sleep in just as much as you love to look at it. Dogs are intelligent animals, and they know when they need to take cover from the outdoor elements. Some might need some time to get used to having their own little house, but once it gets chilly outside, and as long as you provide comfortable blankets for them to sleep in inside the doghouse, then it is unlikely that they will refuse to use it. Always measure your dog before making a purchase and compare those measurements to the ones of a potential dog house. 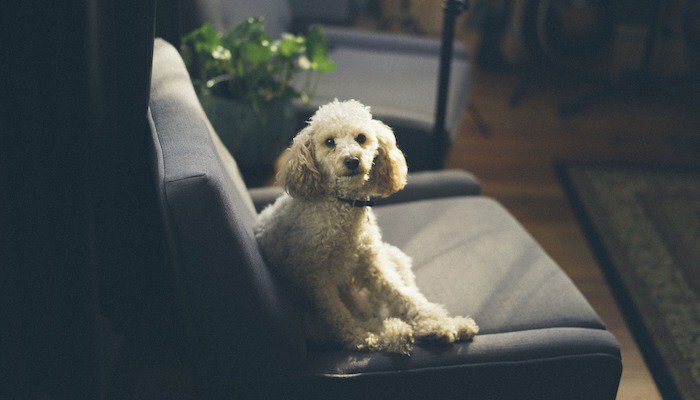 You will want your dog to be able to sit, stand and turn around inside the house, because while most dogs curl up when sleeping – you don’t want to provide them with a hideaway in which they do not fit properly. You also need to take into consideration how many dogs will be using the dog house. In most cases – one house per dog is recommended, but if your pups are professional snugglers that like to sleep together, then you just need to make sure you get a dog house that fits the two of them. This depends entirely on your needs, but we recommend the sturdy ‘Petsfit Dog House’. It is spacious, sturdy and properly ventilated, and it keeps the inside warm and cozy even on cold days. The top opens and the bottom is removable for easy cleaning. The ‘Indoor Outdoor Dog House’ is a lightweight plastic dog house that fits pups all sizes, and that can be used both inside and outside. When you have a dog house inside your home, then hygiene is important, which is what makes this product an excellent option due to being easy to wipe off and keep clean. Small dogs usually aren’t made to live outside, but they still might want a nice and cozy indoor dog house! The ‘SENYEPETS Soft Indoor House’ is a soft and fussy den that provides small dogs and cats with privacy, comfort and a sense of safety. It is warm and private and comes in a variety of colors and models. When looking for a dog house for a large dog, you might want to take it a step further and choose a product that will look amazing in your backyard. 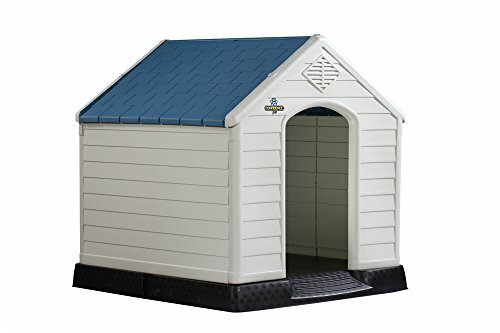 The ‘Boomer & George Antique Large Dog House’ looks like a real house in miniature; with a roofed porch and two doors, something that means it can be used for two dogs, or for one that needs a bit of extra space. Dogs get cold just like people do, and it is only fair to provide them with a comfortable resting place for when they need to be outside in the yard. Yes, dogs have fur, but it is difficult to stay warm when you are lying down to rest, and while a dog might be fine during long winter walks, they do need somewhere to take cover once they slow down. The right dog house will keep a dog happier during yard time, and it will help prevent him or her from catching a cold or other weather-related illness. Our dogs offer us constant devotion and love, and the least we can do is to take proper care of them in return. Pick a dog house suitable for the climate in which you tend to use it. 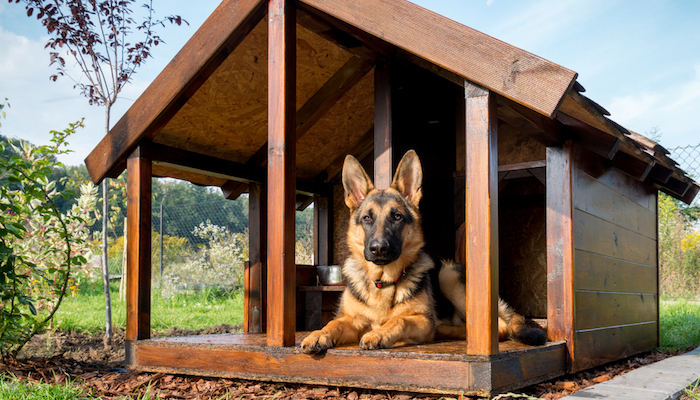 If it gets cold – get a wooden dog house with insulation. If you live somewhere warm where it just rains a lot, then perhaps a large plastic dog house will be a better option. Dogs can get both frostbite and hypothermia, just like people, and a dog house helps prevent this by keeping them warm and comfortable when it is cold outside.